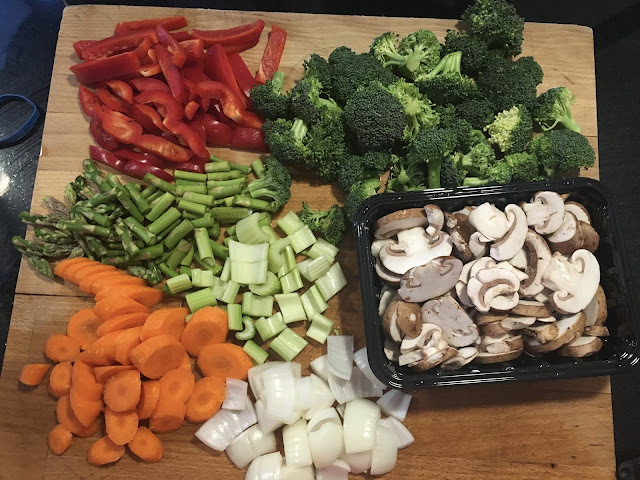 Stir-fry used to be a staple in our diet but since we have made menu planning a part of our lives it is fairly rare for us to have a lot of vegetables sitting in the fridge needing to be used up. This past weekend, we did have some extra vegetables so I was able to make an old favourite. This isn't so much of a recipe, but a good way to use up leftovers. Cut up whatever vegetables you like - we had red pepper, broccoli, asparagus, mushrooms, celery, carrots and onions. Rather than using a jar of stir-fry sauce, I prefer to use the following ingredients: soy sauce, garlic, sesame oil, ginger paste (or fresh ginger) and sweet chili sauce. Heat vegetable oil (2-3 tbsp) and sesame oil (1-2 tbsp) in a wok or frying pan. The amount you need will depend on how many vegetables you have. Add 1-2 tbsp of ginger, and 3 cloves of minced garlic to the hot oil and stir-fry for a minute, but don't let it burn. Add the onion, carrots and celery (these veggies usually take longer). Cook until the onions are tender. Then I added the peppers, asparagus and mushrooms. Cook until these veggies have softened. Then I added the broccoli. Then cover and let the veggies steam for a but until they are brightly coloured, don't overcook the broccoli. Finish it off with a splash of soy sauce and the sweet chili sauce. You can adjust to taste but don't overdo it because it can overwhelm the flavour. Serve over rice or noodles. Top with more soy sauce or sweet chili sauce if you want. If you want to add chicken, pork or shrimp, fry it up with the hot oil, garlic and ginger, but remove from the pan while you cook the rest of the vegetables and add back in before adding the soy sauce and chili sauce. Another nice addition is chunks of pineapple or canned mandarin oranges added when you serve it. This is also a good recipe for kids to help with because they can add the vegetables (but get them to stand back when you are adding the garlic and ginger to the hot oil, splatters everywhere!). Healthy and a good way to get rid of stuff in the fridge. Beautiful colours and tasty, too! Thanks for the tips! This looks yum and so simple. love a good stir fry. I sometimes use oyster sauce or hoisin too!